After 18 long months, I have finally been permitted to contribute some "nibbles" for a village fundraising event. "At the back, and if they're warm, put them on top of the radiator"*, instructs the Controller of Village Events (COVE) when we get to the church. "Made those, did you? How GRAND." Things involving plates of food are commonplace in our village and because we have Incomer's Fear, we go to almost all of them. The result of all this event-going is that I am now a 100% Top Expert on Village Social Event Food. The even better news is that I am prepared to share my considerable expertise with you, my adoring readers and/or fans, ensuring that anyone about to make their debut as a provider of "Village party nibbles" will seamlessly integrate alongside Jean and her cheese straws. I will, first of all, delineate my Village Context. From this, you will be able to extrapolate how relevant my Village Social Event Food will be in your own Village Context. 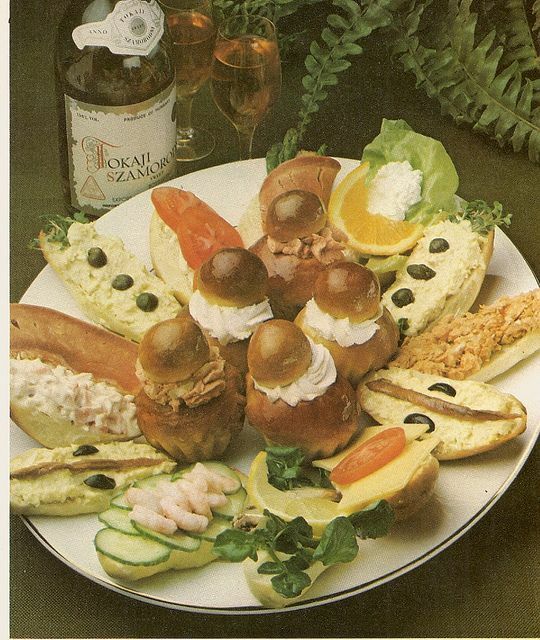 Best description of village so far: "650 alcoholics clinging to a hill"
A Beginner's Guide To Suitable Village "Nibbles"
Waitrose Poshest Chorizo and Ptarmigan Rolls: See smoked salmon on blinis, above. Seen to be slightly vulgar and showy-offy, which doesn't stop the sneeriest clambering over each other to stuff them in their gaping maws. I will be surprised if you tell me that this guide is not useful. I will be even more surprised if you don't have contributions of your own to make (I direct you to the comments section below), and I am interested in hearing them. So happy you wrote this post and brought back memories of village life. Australian university food at dreadful sundowners looks more fancy than many of these things, but in reality is mostly awful. God, how we've missed you. @elsan I am happy you are happy! I am keen to know what food they give you at Australian university sundowners mind you so that I can surprise and delight 'the ladies' at the next Village Social Event with some 'antipodean treats from a friend'. @nellig you legend, thank you. This resonates. Here in the deepest darkest shires - Shropshire - we're still firmly set in the ways of the 70s. I suspect the cuisine of this century is expected around 2050. The cheese and pineapple 'hedgehog' still graces the village hall trestle table. A more sophisticated version may include maraschino cherries. Trifle, a boozy, sweet confection topped with whipped cream and sprinkles (and possibly spikes of crystallised angelica and maraschino cherries) is invariably served in an unappetising dollop. The reasonable white wine I buy for the village hall bar is generally slaked with lemonade (full fat variety) as it's deemed too sour otherwise. And then there are the cups of tea. There's always bloody cups of tea. This was ok I suppose. Thank you for this extremely useful guide - I too now live in a village, so it will come in handy. However, my village is in Scotland so there is a lot more cake and sometimes even Empire biscuits.